I was strolling through the commotion of downtown Copenhagen, past chain restaurants dressed up to look old, and under towering hotels that seem to be part of a different international chain each year. Then, as if from another age, a man pedals his wife on a "Christiania Bike" — two wheels pushing a big utilitarian rounded bucket. You'd call the couple "granola" in the US — they look as out of place here in Copenhagen as an Amish couple in Manhattan. Later that same day, I paused to watch a parade of ragtag soldiers-against-conformity dressed in black venture through the modern bustle of downtown Copenhagen. They walked sadly behind a WWII vintage truck blasting Pink Floyd's "Another Brick in The Wall." I'd never really listened to the words until now. They're fighting a rising tide of conformity. They want to raise their children to be free spirits, not cogs. 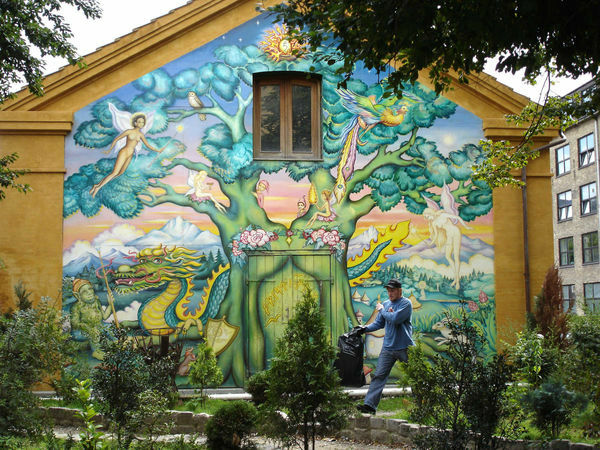 On their banner — painted onto an old sheet — was a slogan you see in their Christiania squatter community: "Lev livet kunstnerisk! Kun døde fisk flyder med strømmen." ("Live life artistically! Only dead fish swim with the current.") They flew the Christiania flag — three yellow dots on an orange background, from the three "i"s in "Christiania" (or, some claim, the "o"s in "Love Love Love"). In 1971, the original 700 Christianians established squatters' rights in an abandoned military barracks, just a 10-minute walk from the Danish parliament building. A generation later, this "free city" still stands — an ultra-human mishmash of idealists, hippies, potheads, nonmaterialists, and happy children (900 people, 200 cats, 200 dogs, 17 horses, and 2 parrots). There are even a handful of Willie Nelson–type seniors among the 180 remaining here from the original takeover. When someone moves out, the community decides who will be invited in to replace that person. A third of the adult population works on the outside, a third works on the inside, and a third doesn't work much at all. Christiania, which sprawls just behind the spiral tower of Our Savior's Church in the trendy district of Christianshavn, welcomes visitors (even offering tours daily in summer). 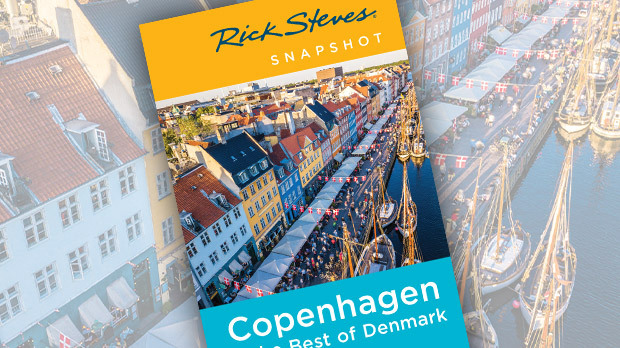 They've become a major part of the economy — the place is now the second-most-visited sightseeing stop in Copenhagen (move over, Little Mermaid). Tourists react in very different ways to the place. Some see dogs, dirt, and dazed people. Others see a haven of peace, freedom, and no taboos. Entering the community, you'll see a sign announcing that you are leaving the European Union. The main drag is nicknamed "Pusher Street" for the marijuana-selling stands that line it. (Residents intentionally destroyed the stalls in 2004 to reduce the risk of Christiania being disbanded by the government, but today, the stalls are back.) On my last visit I noticed a small, pungent stretch of Pusher Street, dubbed the "Green Light District," where pot was being openly sold (signs acknowledged that this activity was still illegal, and announced three rules here: 1. Have fun; 2. No photos; and 3. No running — "because it makes people nervous"). As you walk down Pusher Street, you'll see Nemoland, a kind of food circus. At the end of the street, a huge warehouse called the Green Hall (Den Grønne Hal) does triple duty as a recycling center (where people get most of their building material), a craft center for kids, and an evening concert hall. Behind it, you can climb the ramparts overlooking a wide canal that's lined with cozy if ramshackle cottages. From the Green Hall, a lane leads to a pleasant café, and beyond that, to the Morgenstedet vegetarian restaurant — a great place for a simple, friendly meal. (And a former barracks near the entrance now houses Spiseloppen, a wonderfully classy restaurant serving up gourmet anarchy by candlelight.) Away from Pusher Street, you'll find yourself lost in the totally untouristy, truly local residential parts of Christiania, where kids play in the street and the old folks sit out on the front stoop — just like any other neighborhood. There are nine rules here: no cars, no hard drugs, no guns, no explosives, and so on. While biking through the community, I realized that, except for the bottled beer being sold, there was not a hint of any corporate entity in the entire free city. Everything was handmade. Nothing was packaged. Of course, that rejection of corporate mores is part of what makes this community's survival so tenuous. Christiania has long faced government attempts to shut the place down. Back when real estate was much cheaper here, city officials looked the other way. But by the 1980s, the neighborhood had become gentrified, and both the city and developers were eyeing the land Christiania's hippies were squatting on. When Denmark's conservative government took over in 2001, they vowed to "normalize" Christiania, with police regularly conducting raids on pot sellers. Things were looking grim for the Christianians until 2012, when the Danish government offered to sell most of the land to the residents at below the market rate, and offered guaranteed loans. In exchange, the Christianians promised to upgrade and maintain water, sewage, and electrical services, and preserve rights of way and "rural" areas. These days, every adult Christianian over age 18 owes a monthly rent that goes toward paying off the loans and to support services. Many members of this socialist utopia are uncomfortable with the idea that they now own property, albeit collectively. But on the flip side, this is the greatest degree of security Christiania has ever experienced in its four-plus decades of existence. Even so, mistrust of the establishment is by no means dead, and there are still those who wonder what the government might be up to next. A few years ago I received an email from some readers who'd visited. They said: "We're not prudes, but Christiania was creepy. Don't take kids here or go after dark." A free city is not pretty; I agree. But watching parents raise their children with Christiania values, I came to believe more strongly than ever in this social experiment. Giving alternative-type people a place to be alternative is a kind of alternative beauty that deserves a place.